Our Coho greeting cards were created in collaboration with the amazing folks over at Sentinel Printers here in Santa Cruz, California. It took a long time to get these cards right. These cards are printed using offset printing to capture the rich interior color of the fish first. Then two separate plates were created to stamp the detailed black outline that you see detailing the fish body. Sentinel Printers uses a Heidelberg Press for the letter press technique. 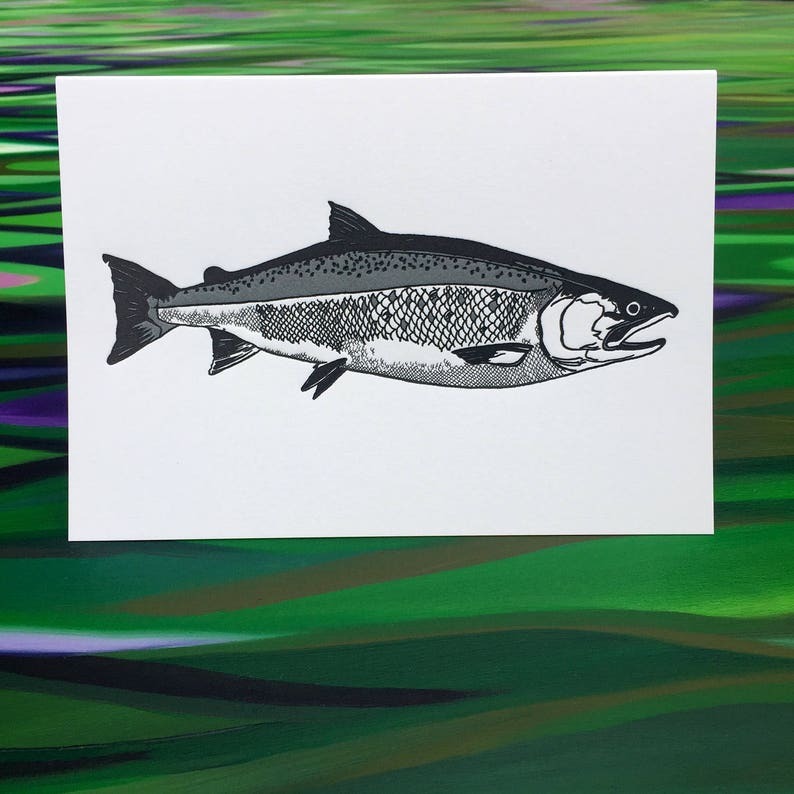 The coho design is not only printed on the card, but embossed into the paper so that you can see it through the paper on the inside of the card. Legendary paper maker, Strathmore paper, is used for both the card and the envelope. Each card and envelope is wrapped in biodegradable plastic. Cards are sold in packs of 6. Meaning, you are buying 6 Coho cards with envelopes in this listing. Cards are blank inside so that you can customize your message. Each card measures 4" Tall X 6" Wide. 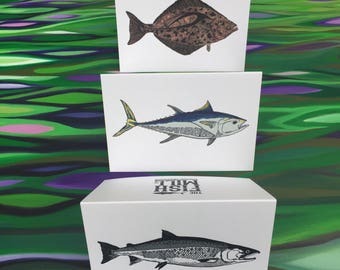 If you would like to by the Coho, Bluefin, and Halibut cards in smaller denominations, please purchase using the listing that sells these three designs in a pack of 6. This particular pack of 6 comes with two of each design (Coho, Bluefin, and Halibut). The compliment that I get the most with these cards are that they should be framed. I hope you feel the same way. We did not cut any corners when we went to the drawing board on these. Please message me if you have any questions. Thank you for your consideration.